Rounds 13 and 14 of the championship rounded off the European season with the two classic races at Spa and Monza. In many respects, the two races are similar in what they demand from the car, the variable weather at each only added to the similarity. Each track is a mix of very slow and very fast, with the faster sections contributing more to the lap time and hence has a greater influence on set-up. Both tracks are deemed low downforce\drag tracks, but with more testing corners Spa requires a slightly higher level of aero grip. This places Spa on a par with Montreal for wings, whereas Monza remains the only super-low downforce track on the calendar. Thus we saw the shallowest wings fitted for this one-off circuit and the cars shorn of their aerodynamic addenda. The cars are certainly more pleasing to the eye in this guise, a sign of the aerodynamic rule changes due to take effect on 2009. Unpredictable rain at both events conspired to make the teams work harder at each weekend. Spa threatened rain but there was little reason to risk a softer set up to aid grip in the wet. At Monza, it wasn't clear if the race would be held in dry or wet conditions and the teams largely opted for a full dry set-up. For Spa, Ferrari brought a major upgrade to the F2008. These included a revised rear wing and new fins under the nose. The latter appeared only at Spa, allied to the nosecone without the slot. 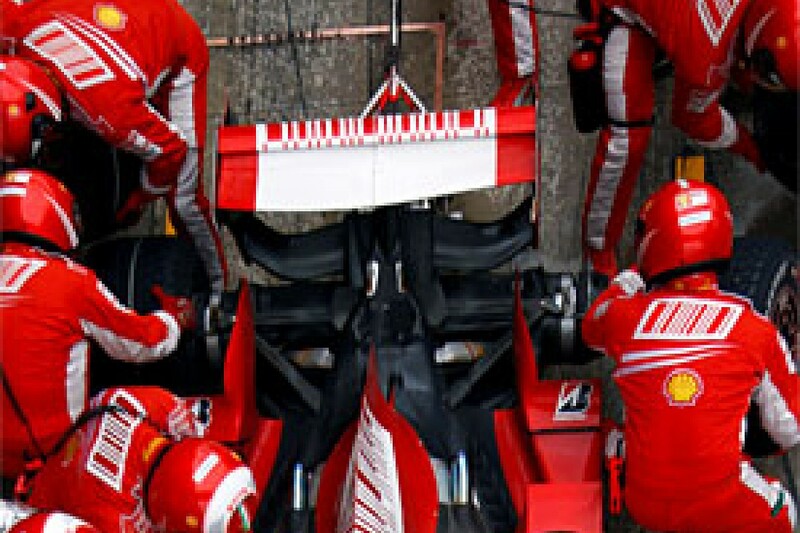 Appearing just below the top wishbone, the fins are aligned with the flow rising off the front wing and direct it back downwards. At the rear of the car, the lower beam wing was reprofiled. Whereas previously the wing was nearly straight, now the outer span is kicked upwards. At Monza, the car ran a far more radical set-up. This did not delete as many parts as other teams, but did include an asymmetric rear wing, the Spa beam wing, one element T-wings, and a front wing with a revised flap and supports. The radical rear wing uses a main plane shorter on its left side. This creates a different loading on the wing from one side to the other, the right side creating both more downforce and drag. As Monza's faster downforce-dependant turns are largely right handers, the inside tyres would be more lightly loaded due to centrifugal force. 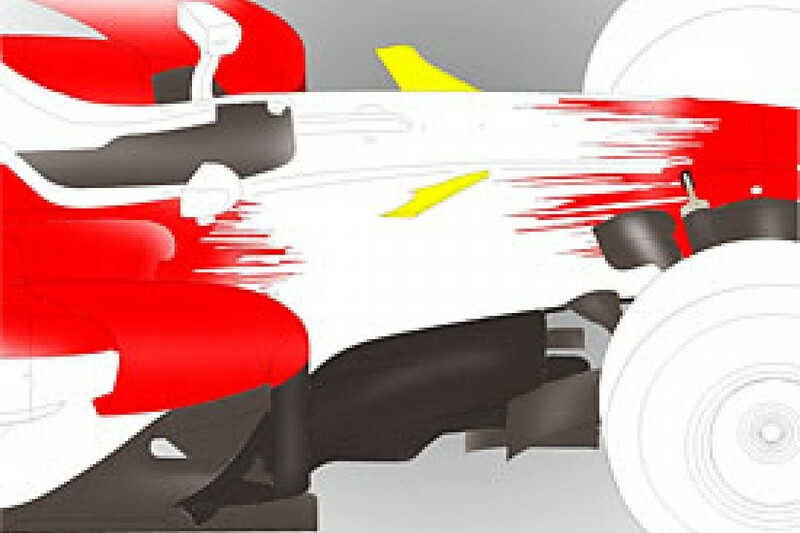 The extra load from the asymmetric rear wing places more aero load on the inside rear tyre. 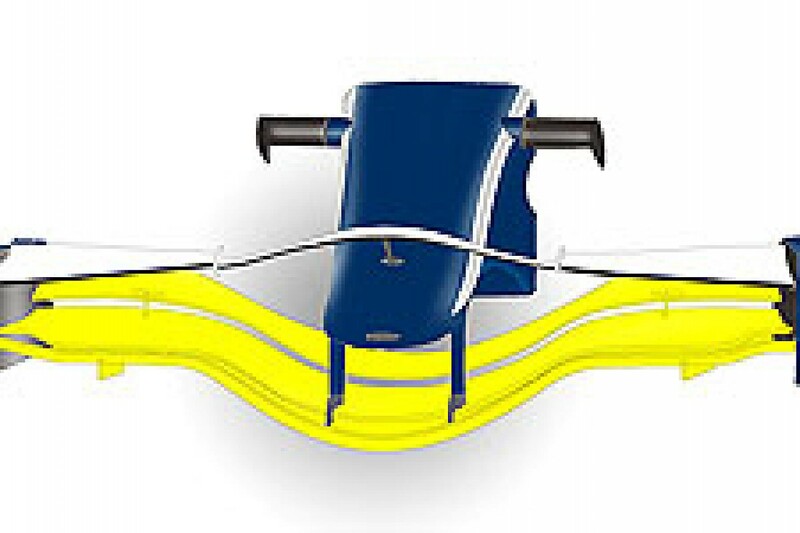 In theory the wing should produce less drag as it only produces downforce where needed, which aids top speed. As one of the teams with the most complex set of aero add-ons, BMW Sauber also commonly have the most stripped-out set up for Monza. This year, the nose fins and T-wings were removed, while the rear wing gained a full width serrated gurney flap, to aid the serration on the middle of the beam wing. 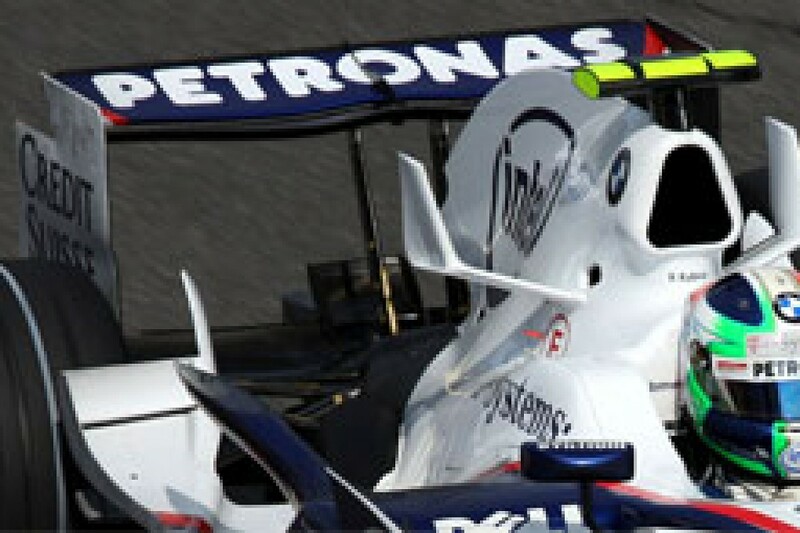 A serrated gurney flap provides both the extra downforce to tune the rear wing as a conventional gurney, but also produces less of a drag penalty than normal. Faced with a tight battle for fourth in the constructors' championship with Toyota, Renault have persisted with development on the R28. Aiding a forward weight bias for Spa were revised front wing endplates. These featured two pockets in the sides of the endplates to house ballast. This is in addition to sizeable pockets already moulded into the front wing itself. These endplates appeared at the pre-Monza test, at which new wheel fairings were also tried. Based on the normal wheel fairing, the new versions had a series of louvers on the front edge to provide additional cooling. However, with the poor weather on the race weekend their additional cooling was not required. With the races leading up the end of the season (Monza excepted) all featuring long, high-speed turns, Williams have sought to redress the aero issues they have on the FW30, with a new front wing. They've found the car suffers in longer turns as the effect of rolling and the front wheels being steered degrades the front wing performance - thus the car increasingly understeers. This issue was not supposed with happen with the more aggressive front wing introduced in Turkey, the square jawed centre section and flatter outer spans were not believed to be attitude sensitive. These features were absent on the wing, which features a more progressive dip in the centre and slightly raised outer tips. 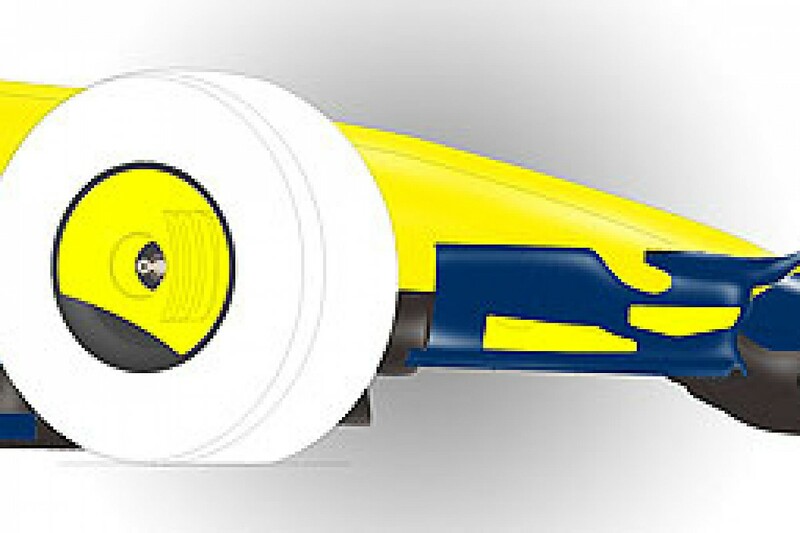 These would intuitively reduce roll sensitivity by placing less of the wing in close proximity to the ground, while the raised tips would be less affected by the front wheel being steered. Joining this year's trend, Toyota fitted cockpit fins for Spa and they remained on the car for Monza. 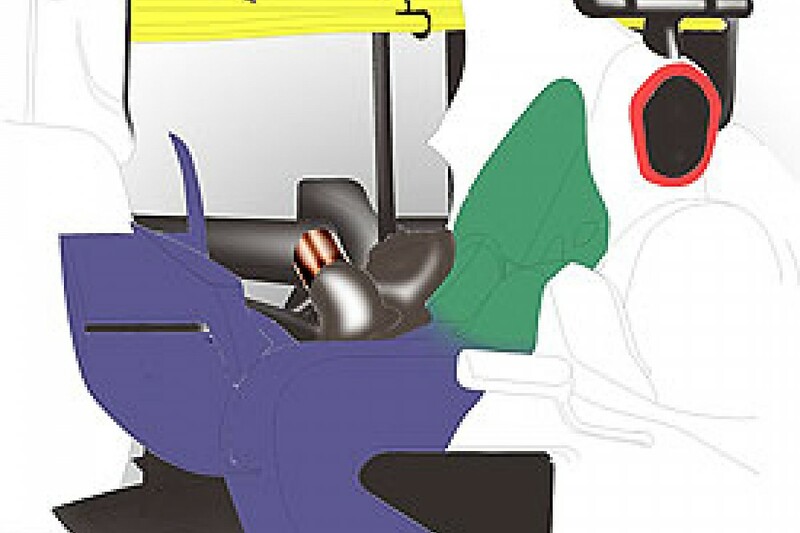 These help point the upwash from the front wing down over the rear of the car; this costs some front downforce but aids that created at the rear of the car. Also aiding drag reduction was the Monza aero package. This featured a very flat front wing, the lack of a dip at its centre made the nose appear lower, but this is an optical illusion created by the shorter pylons. Honda made a huge effort for their Monza aero package. Deleting almost all of their extraneous aero details and introducing a new rear wing, a new front wing, and endplates. Despite the Viking wings, pod wing, and T-wings all going from the car, the 'Dumbo' nose fins remained. At the rear of the car, the low drag "W" wing seen in Canada and Spa was replaced with a new rear wing. This was a two-element wing, with a slightly raised middle section and unusual large cut outs at the tips and in the middle of the wing. Red Bull have used a similar cut out in the middle of the medium downforce wing for over a year, but it is not as large as the one seen on the Honda. The effect of the cut out would be to reduce the length and angle of the wing in that area. This would create a lot less downforce and hence drag. It appears that the wing does its hardest work in creating downforce in the middle of each side of the wing; this is backed up by the slender wing sections needing a reinforcing rib added to the flap. At the other end of the car, balancing the low downforce rear wing was a flatter front wing, similar in approach to Toyota. This was matched to new endplates featuring a dramatic downswept flick. This flick is clearly creating lift, as this isn't desirable even with the low downforce demands of Monza. So the flick must be used to aid the aerodynamics around the front wheel, or something else downstream of the wing. McLaren surprised with apparently little new on the car over the course of either grand prix. There was, of course, a Monza-specific package, which deleted the antler-like nose fins and the T-wing attached to the chimneys. Uniquely, the McLaren was the only car with a single-element rear wing; this wing is much flatter in the middle of the span and was allied to simple endplates.